Anton Stankowski’s early work was done in the early 1920s, which were influenced by suprematism, constructivism, De Stijl, and the Bauhaus. Yet Stankowski did not subject his work to these different dogmas, but circumvented these purely formal directions, since functional design was of more importance to him. He deliberately developed his work to fit into a complex of overlapping themes. His early works convey information. 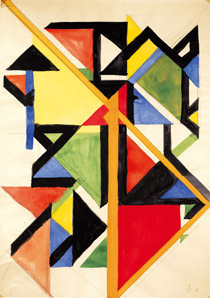 In order to do this, he used the entire spectrum of geometric abstraction, and was constantly prepared to innovate and cross over the usual boundaries among different forms. Even then, the diagonal was a preferred visual element. 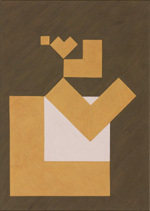 Early on, he strove for clear spatial construction, and thus took on a special role among the abstractionists. 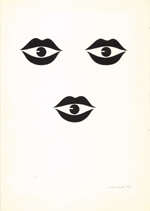 From 1928 to 1930 Stankowski worked on his design primer, containing 60 works on paper, evidence of a new type of visual language and a non-dogmatic use of forms. 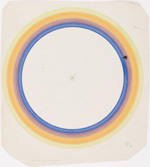 He played with positive/negative, arrangements and series, perspectives, and collages — all various stylistic methods that helped him in the visualization of concepts.